This is not a review, just quick measurements from one sample. Second one is still on the way. Very happy with the bright hotspot. This throws better than I expected even though the numbers do match the specs. The hotspot just is a bit smaller than I thought it would be. 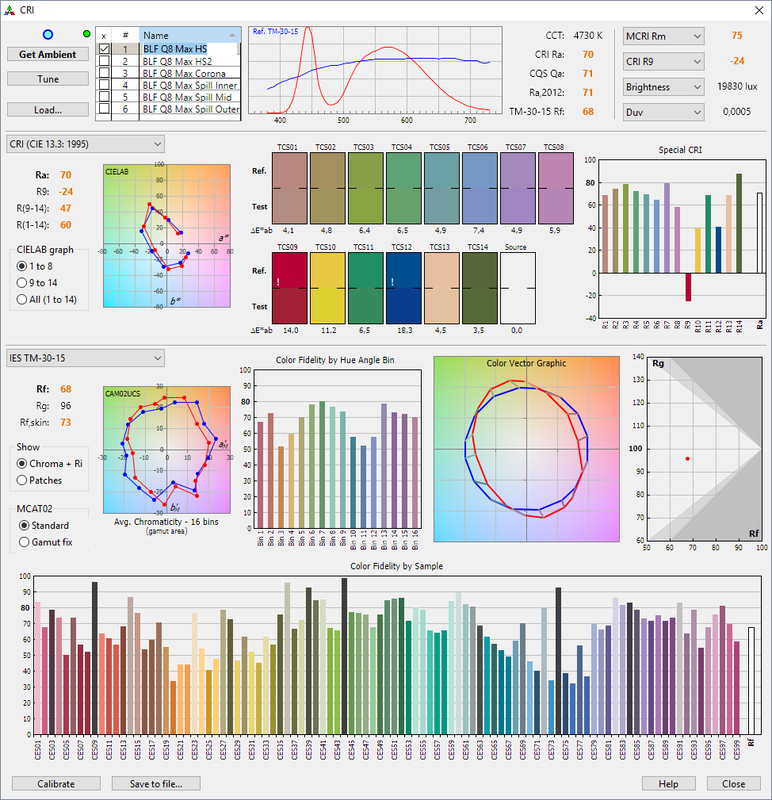 Tint shift with different output levels. Just ramped a bit and measured. Tint shift throughout the beam. Max output once again. All in all I’m relatively impressed with the tint. 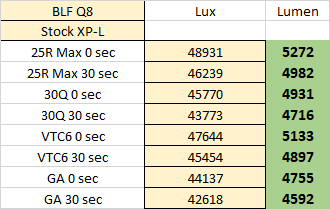 The shift is not as big as I expected for a reflectored Cree XP-L light. 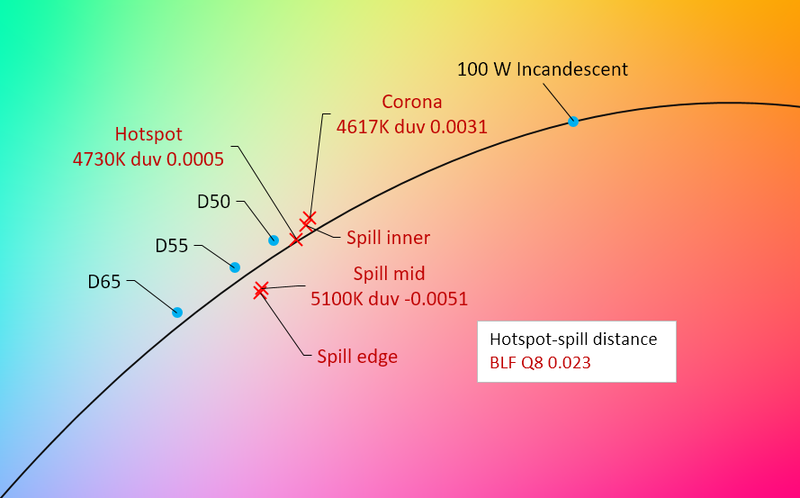 The corona is quite visibly greener and the spill cooler, but the hotspot stays very neutral on higher outputs. Turns quite green on moonlight and the shift towards green on the corona makes it look ever worse. This is of course with white wall hunting. Thanks to the Q8 team, you did a wonderful job! Could you check for sandblast powder in the screw holes of the tail PCB? If there is, clean and try another lumens reading? Is this yawn, hmm could make a difference if there is some powder remaining. Is this shock, hmm a simple blow to bump output seems no reason for shock. Is this sadly exhalation, no worries IF there is powder it is none conductive, hence getting it out improves output. It’s the “shocked” emoji. I know there’s no “worries” but it IS a bit shocking that blowing out sandblasting media is a thing to increase output. I’m not saying it’s even a bad thing. It’s just something I’ve never heard of before, and never would have thought about in a flashlight world. PS: Even with all the negative press about the (IMHO minor) issues with some of the Q8 lights, I’ve still got nothing but good feelings about the project in general, and the light itself specifically. I’m looking forward to holding mine in my hand(s). I’m confused lol. Will cleaning the screws out actually help? The two screws near where the positive contact ring for the batteries is? Just wanted to update you. Unscrewed my PCB. One of the four contact pads on the battery tube had what looked to be thermal compound(or sandblast powder) adhered quite well to it. I had to scrape it off. Was easier when wet so it may have been sandblast powder. Was covering a good portion of the contact area, but my batteries were all at 4.05v so they seemed to have discharged evenly. Screws all had to be cleaned as well. Threads were dirty too but I wasn’t sure how to clean them. I tried rotating a piece of foam earplug material in them. Seems like it may be slightly brighter now but I can’t say for sure because I have no measurement equipment. Love your work maukka. Thanks for taking the time to post it up. Wow thanks! Could you check for sandblast powder in the screw holes of the tail PCB? If there is, clean and try another lumens reading? No sandblast, but the screws weren’t tightened very well and there was some solder blobs on one of the pads contacting the body. Remeasured after fixing that and cleaning all the contacts with IPA. Solder blobbed some VTC6’s and surprisingly they also performed worse than my 25R’s. Did the measurements two times to verify. This seems to indicate some sort of battery contact resistance problem, since naturally the VTC6 should perform better. Pretty much no difference with the 25Rs (2% increase), but the 30Qs did a bit better this time with 4% improvement. Also remember that my numbers are about 5-15% lower than most people’s and I would definitely consider this falling within specs. Also checked the IR of the batteries at 5A, almost fully charged. With good cells and clean tail screw holes it is higher. I do not recommend it (I already know a case of putting one battery in reversed and the springs nicely acting as a fuse ) , but bypassing the tailsprings will give at least a 500 lumen bump. On mine the tail screw holes were perfectly clean, no glue. Oh well, guess Thorfire wont be the next group buy manufacturer. 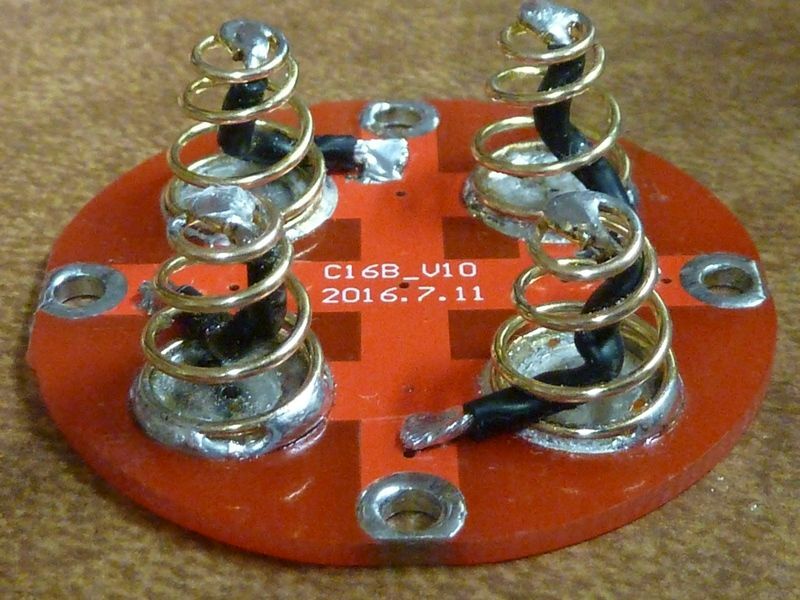 I’m not in any other BLF-flashlight team other than the Q8, but despite that it was quite an adventure with Thorfire, especially the communication, they have succesfully finished the Q8 project. They have more or less followed our design demands, did the part of the design that we as Q8-team were not capable of doing in a satisfactory way, stayed within the initial cost goal, and finally produced a light of which the specs are quite a bit better than we hoped for. To mention the most saillant detail: we never thought beforehand that Thorfire was prepared to make the massive copper DTP-board (that is central to the performance) we asked for. 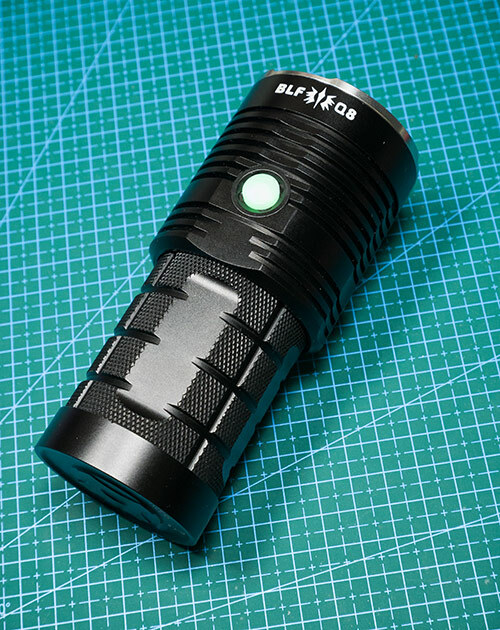 So I believe that this BLF Q8 project in coopereation with Thorfire is as succesful or better than any previous BLF custom light project. A new project with Thorfire will certainly be a challenge again as far as communication goes, and they will certainly again struggle to get the details on the level of premium brand lights, but I’m confident that a next project with Thorfire could be succesful, and expect that if the Q8 project turns out to be profitable for them, the communication thing will only become better. 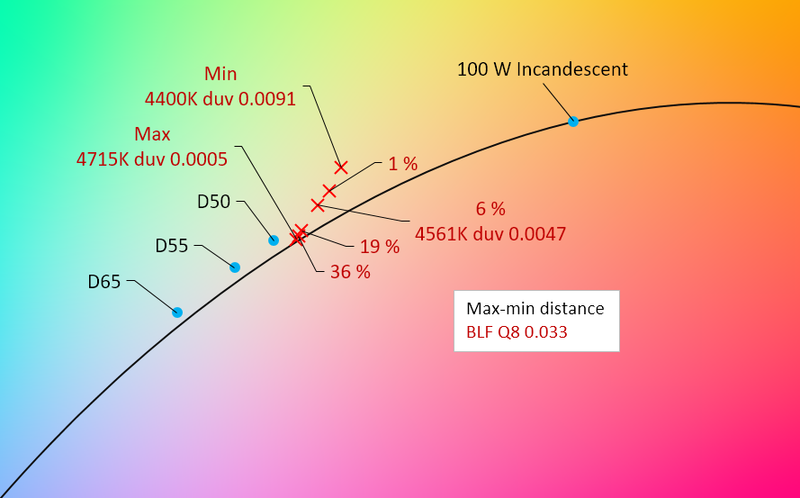 So I believe that this BLF Q8 project in coopereation with Thorfire is as succesful or better than any previous BLF custom light project. I agree, I’m overall very content with the result, especially at this low price. This is the first batch and I’m confident they will improve the minor flaws we found. My first sample worked out the box, meets the specs, feels very well made and was cheap. What more could a BLFer want? As a hobbyist, the little QC things aren’t very serious and can be fixed easily, except for the switch light problem, but mine works fine. Also with the Millers amazing patience and abilities working alongside lots of members here far cleverer and smarter than I has really taken this forum to the next step in one huge leap. If the Miller or anyone like him has the patience to keep organising projects like this the lessons learnt from previous experiences will only make future projects far better from which most of us here will benefit greatly from by having world class flashlights with leading edge firmware etc at a budget price. The amount of work that is going on behind the scenes here by most of Millers team is incomprehensible. These guys and gal do far more charity work here for us than Charity workers do themselves and at times with little thanks so the thanks they do get is warming to the heart especially after the months and months of tireless work when things dont go 100% to plan. Thanks all involved in the projects and that includes everyone here that has commented on the good and bad things that has happened so far in making this place a new and exciting place to be and for making world class flashlights like nothing else in the universe. A most excellent post! I can't imagine the effort and patience involved. What a success! Notice I added solder on the rings around the screw holes? This is it ensure positive contact to bare shelves where the threads are located. 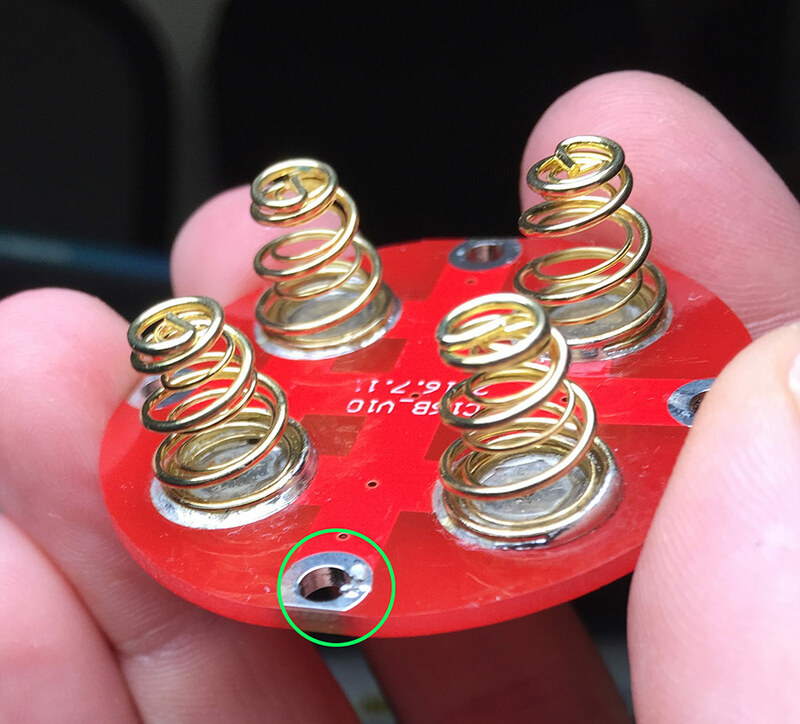 The exposed rings (without the added solder) are actually lower than the surrounding solder mask so I don't see good contact there. Clean/sand those shelves, add light layer of NO-OX-ID. Who cares about conductivity of the screws (poor conductors anyway) when you have much better metal to metal contact from the screw holes to the battery tube. Also drill out the driver mount holes to 1/8", get rid of any burrs in all threaded holes, tail and driver mount threaded holes. Tinning those rings helps make then do what they were supposed to do. It's also the shortest path from the springs (bypass in this case) to the battery tube. Also totally removes any need for conductivity through the screws. Thanks for the tips. I’ve been following the Q8 threads and will do the simple mods and remeasure soon.